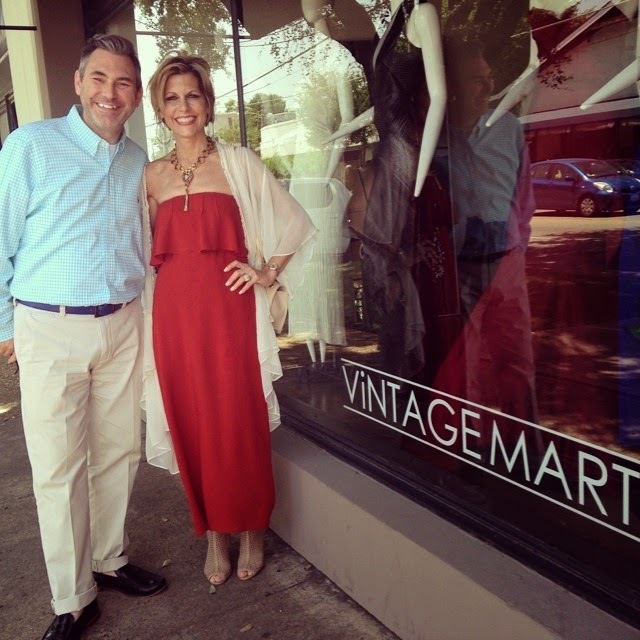 If you're intrigued by things of the past, or, as I look at it, things with a past, you'll be delighted and amazed at Vintage Martini, which recently moved from Carrollton to Henderson Ave. in Dallas. Ken Weber, owner of the store that carries vintage jewelry, shoes, handbags, and accessories as well as apparel for both men and women, kicked off last Saturday's Grand Opening with a toast as he unveiled the store's fall and winter clothing collections, including a beautiful assortment of coats and fur. The fun continued throughout the day begining with a trunk show featuring Joseff of Hollywood jewelry, including some pieces that were accompanied by photographs of acting legends wearing their treasures. A vintage Hermes trunk show followed, and, later, Clay Kennedy of Stag Designs, showcased his incredible buffalo and leather weekenders, duffels and accessories. Media personalities, fashion bloggers and influencers in attendance included Clarice Tinsley, Annie Potasznik, Lisa Petty, Jhonatan Arreola, Edwardo Flores, Small4Style's Alex Small, Ekaterina Kouznetsova were busy gathering details for their respective news outlets. Meanwhile, designer Andre Yabin of Binzario Couture, Susan Posnik of Susan Posnik Cosmetics, Mindy Loll of SavoirLuxe, Daniel Perez of Caviar Club Menswear and Cynthia Salzman Mondell, award-winning documentarian of Sole Sisters, were eagerly welcomed by Weber and his staff to their new location. As the evening progressed, Fashion Photographer Evelyn Murphy, whose work has been featured in the likes of fashion magazines such as Vogue Italia, also made a personal appearance just before the Matt Tolentino Trio turned the vintage store into a jazz club as the crooners had guests swinging to their '20s and '30s tunes. Even if you missed the grand opening festivities, you're still in for a treat. The move to Henderson Ave. has allowed Weber to nearly triple the size of his location, giving customers a larger selection of merchandise in what he refers to as his 'dream store.' Dreamy, indeed, from the moment you walk through the doors, you feel as if you've been catapulted into another place and time - the people and sounds outside the store instantly disappear as your eyes jump from the oversized-jewelry case sparkling with treasures to the beautifully-colored apparel each vying for your attention. 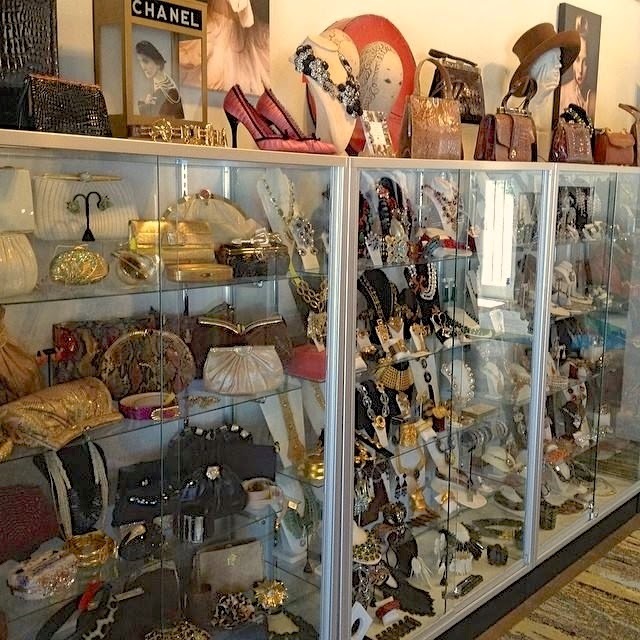 "The thrill of hunting out the most fabulous items for Vintage Martini keeps me excited," confesses Weber but, adds, "While we do have a small area of collectible garments, my goal is to carry pieces people can incorporate into their every day wardrobe. After all, most people don't realize that today's fashions are essentially a copy, or a slightly different interpretation, of a vintage piece." In fact, he attests that some of his store's biggest clients are fashion designers who purchase pieces from his store for inspiration. When it comes to incorporating true vintage pieces into your wardrobe, Weber simply states: "Mixing and matching new and old is the best way to showcase your personal style without looking like a page from a catalog." If you dress in vintage from head-to-toe, you're likely to look like you're wearing a costume or you got stuck in a time machine. Pick one vintage piece that best suits your individual style and make it the focal point of your outfit by incorporating simple pieces around it. While incorporating vintage pieces can create a fun, new outfit, it's important that the overall look still reflects your own personal style. Each new journey begins with a single step. Consider adding small vintage pieces to your wardrobe, such as jewelry, handbags, scarves or shoes, until you become comfortable with investing in apparel, for example. The bottom line to vintage dressing is having fun and 'owning' your look. Whatever you choose to wear, wear it with pride and confidence. Learn the history behind the item you're purchasing - from what era did it come? from where did it come? who designed it? what about it appealed to you? Then, when people ask about what you're wearing, you have an exciting story to tell. Not only will you look great, but you'll also be a lively conversationalist!